How the times have changed. Twenty years ago, it was much more common to see people in Chicago moving pianos–be they uprights, baby grands, or grand. Today, well, it’s easier to buy an electric keyboard or synth containing thousands of pre-built sounds. Well, there’s an easy answer and a hard answer to that question, so let’s get into it. Yes, we get it. We consider ourselves some of the best Chicago professional movers so of course we’re going to advise that you hire us or other professional movers when transporting a piano. Why? Despite the fact that the sheer number of different types of pianos each creates a different kind of moving obstacle, you then have to contest with the challenges posed by both where you’re moving it out of and to, which are likely considerable. Plus, while packing art yourself is one thing, considering that art is often similar in price to some pianos, sometimes it makes sense to call in the professional. So call us biased, but this is one situation to consider using specialists. Plus, pianos are heavy and awkward. If something goes wrong, you could really hurt yourself as well as potentially damage your pricey musical beaut. Now when it comes to moving a piano yourself, there are countless articles online to advise you on the many different types of pianos out there and how they should be moved. As we often say, planning is key to any move and it’s especially important here. Verify the type of piano you own and the equipment you’ll need to achieve the move. You’ll likely need at least one dolly, furniture straps, and a rental truck, depending on the size of the piano. Oh, and you’ll want a team of willing friends as moving a piano by yourself is a recipe for an emergency room visit. Wrap it. When preparing the piano, wrap it in blankets and do not trust those metal casters or wheels to get you any further than a few steps; they were not built for this kind of moving. Communicate. Teamwork makes the dream work, right? 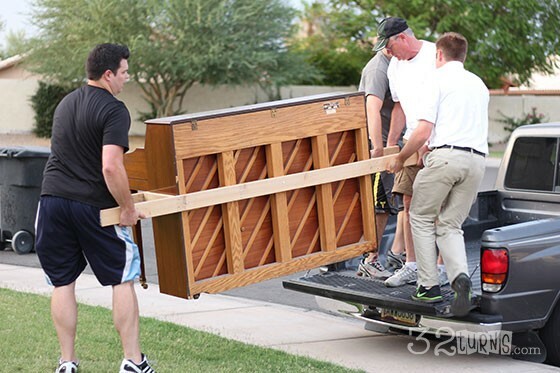 Get your team together and organize a plan for how you’re all going to work together to get the piano into the truck or van, either by lifting it or placing furniture steps and working it gently onto the dolly. In some cases, the piano may be light enough to carry onto the truck, but believe us, those cases are far and few between. If it’s an upright piano, with a flat top, your best bet is to try and flip it upside down and put the flat top on the base of your flat dolly. This will make it much easier to move and create a solid ground to transport. Use your ramps. Once the piano is safely on the dolly, now is the time to use a metal ramp to bridge the gap and mind it ever so carefully as you inch that precious piano up into your vehicle of choice. Now, if you’re set on figuring out how to move a piano by yourself, at least give us a call so we can give you a few pro tips. But really, if hiring a full team of movers is outside your budget, considering hiring at least one of our expert movers to oversee the move. After all, no matter how much research you do on the internet, nothing beats the experience of a Chicago moving professional.